Since I’ve been back to working in a bookstore full time (for the holidays), kiddo has had a love/hate relationship with her bed. She’s tired, exhausted even, by the end of her days romping at Grandmom’s house. But she wants to see me, she wants to chat. She wants to stay up and play with her Jake & the Neverland Pirate Lego set that isn’t allowed to travel with her on day trips. She loves Grandmom’s house, but a life in transition is stressful no matter how much fun you’re having. We love rich colors. Dark greens, deep turquoises, night time blues… these are the colors that move us. The complimentary oranges, reds, and purples spark our attention. Plus, we’ve got a thing for pirates, we two girls. I couldn’t pass up Charlotte Jane Battles Bedtime. There was a glorious pile of them at the store that I couldn’t keep my eyes off of, and despite having boxes of books in storage, I grabbed this. After all, kiddo just had a birthday and I didn’t get her a birthday book. It was picture book fate. 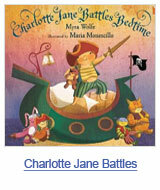 Charlotte Jane belongs on every kiddo’s bookshelf. Every kid, at some point in their lives, will think it’s a great idea to stay up all night playing. But every kid will then discover that the next day – they have lost their oomph. And Charlotte Jane had a lot of oomph to lose. Pirate lingo, swashbuckling imagination, and true blue sentiments of the realm of childhood, Charlotte Jane Battles Bedtime is a classic in its own time… or it should be. We’ve read it every night since I’ve brought it home. Sometimes twice.